As many of you also likely do, I have a growing collection of cables, hardware, and spare parts (screws, connectors, etc.). I'm looking to find a good system of organization so that everything isn't a tangled mess, mismatched, and potentially able to be damaged. Since the the three things listed above are all have varying sizes and degrees of delicacy this poises an interesting problem. Presently I have those cheap plastic storage bins you find at Wal-mart for everything. Cables that were once wrapped neatly have become tangled due to numerous "I know I have a cable for this" moments. Hardware is mixed in other bins with odds and ends with no protection from each other. NICs, CPUs, and HDDs are all interacting and likely causing damage. Finally there are stray parts sprinkled amongst these two both in plastic bags and loose. Odds and ends are the easiest. Screws, connectors, and small electronic parts lend themselves perfectly to tackle boxes and jewelry boxes. Since these are usually dynamically compartmentalized I can adjust for the contents and label them on the outside or inside of the lid. Cables are easily wrangled with short velcro strips but that doesn't stop them from being all mixed in together. Hardware is the worst offender. Size, shape, and degree of delicacy changes with nearly every piece. I'm willing to sacrifice a bit of organization for a somewhat efficient manner. What is the best type of tackle or jewelry box to use? Most of them are cheap and flimsy. Is there a better alternative? How can I organize cables to know exactly (within reason) where one is? What about associating cables with hardware (Wall adapter to router, etc.)? What kind of storage unit lends itself to all shapes of hardware? Do I need to separate by size or degree of delicacy for better organization? Big industrial racking (the metal struts and reconfigurable wood shelves kinda deal like you see in warehouses) for holding large hardware, servers, switches, monitors and workstations. This stuff is awesome if you have the cash and space to house it. IMO it should be standard setup for an infrastructure team to have some shelving like this available, but since some companies won't even give you a dedicated server room, getting a storeroom is sometimes unlikely. Try and keep your servers and the rails that fit them in the same location. Hunting around to find you're missing a single rail mount for a particular server is no fun, and pricey to re-buy. Wall-mounted hooks from which cables are hung in groups - Coiling cables always leads to a mess and wasted time uncoiling them. If you have the space for it, hanging the cables straight down on a wall lets you see the length and keeps them relatively untangled for quick grabs. 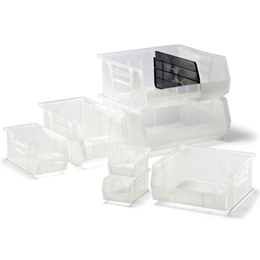 Plastic storage bins for small components. Those modular dump-truck-bin shaped ones that will either standalone on a shelf or stack together to save space. Toolboxes are overrated and never seem to have the right size compartments for all those unique IT widgets. Save the sealable plastic baggies you get with new workstations and use them for stashing bits and pieces as needed. I still haven't figured out a decent way of handling physical media that'll scale for a whole team. We had one of those fancy automated CD storage units at one point... useless. It required having software installed on a nearby PC to operate the thing and just made it harder to access the media you needed. Plastic storage wallets are pretty naff when you end up flicking through for 10 mins only to find that the particular version of smartstart you wanted hasn't been returned to the folder. I did find you can re-purpose the HP cd packs you get with each server by turning the sleeve inside-out and doubling up the number of sleeves inside it... then you can create a grab-bag of build disks and stash it in your drawer. At least that way you can maintain your own collection in a format that's easy to keep with you. Since it sounds like you're in the US, I would recommend looking at a ULine (here are their bin organizers) or similar catalog or if you're looking to step up from Wal-mart or craft stores, take a look at the Container Store (Akro bins). Another quality product is Stanley Professional Organizers (formerly ZAG). I thought the Container Store carried ZAG, but I didn't see any (or any Stanley) on their web site. We have a ton of shelf space along the back of the server room - at least 12' wide and about 2' deep. Since manuals are largely a thing of the past, we use it for pretty much all our storage. Banker's boxes fit very nicely edge-wise on these shelves - it's easy to grab a box by the handle and pull it out - so we use them for lots of things. Misc cables are sorted into three boxes by length - short, med, long. Whenever we buy misc. cables, they come in zip-lock bags, so we keep those and use them for any leftover cables. We've also got a box of various serial cables (which we don't use much any more), a box of USB and firewire cables, a box of fiber patch cables, and a box of weird cables - e.g. a SCSI2 to right-angle VHDCI that cost a bundle when we got it so I can't bear to throw it out. For each server, we keep all the odds and ends that came with it in magazine boxes. This includes all the little booklets, any special cables that we didn't need, screws, anything. This box (or multiple boxes, if necessary) is where we keep any files relating to the server, e.g. setup notes, printouts of license documents, CDs that came with the server. Basically, everything for each server is in one place. For one server we built ourselves, this included a spare power supply, a spare system disk, the spare RAID card we bought with it. Chris mentioned physical media, we deal with this by (mostly) having all the disks we need for each server stored with everything else for the server. So we buy extra media sets and/or burn CDs and DVDs to that we never have to search very far. We have just two racks, 42U, and they came with a ton of caged nuts, extra name plates (one rack is Compaq, the other was bought after the merger and says HP, they both came with blank plastic plates you could put on if you wanted your own logo). All that stuff is in one box, along with a bunch of 10-32 machine screws that fit the couple older racks and the relay racks for our satellite patch rooms. The velcro ties work well for ethernet cables. You can just group them into approximate sizes, I have short, medium, and long. If you have a cage, you can use the velcro ties to tie them to the walls of the cage. With your NICs and HDDs, if they are old and there is very little chance you will use them I would just donate them. The ones you want to keep should go in static bags, and then you can put them all in a box separated by layers of foam. You may want to try to build this around one of those wire "Backer's racks" with the wheels on the bottom if you need to move it around, or without the wheels if not. Configure the shelves so that the top one isn't all the way at the top. This way you can hang the ethernet cables around one of the four posts in short, medium, long bundles. This allows you to grab one without tangling the rest. The shelf space allows you to group hardware together based on either type or size, like keeping the ata drives together, the sata together, the sas together, etc. This can be repeated for NICs, procs, routers, whatever. As for the little bits and pieces, head on down to your local crafts or "Beads" mega-mart. The nature of this hobby basically predicates lots of little bit and pieces so they have varied and numerous storage systems some of which are really modular, which can be adapted to your needs. The other nice thing about the wire rack with shelves is that along with wrapping ethernet cables around the top of the posts, you can use every shelf to do the same thing. So, if you have your routers on the second shelf down, you can dangle the console cables around the post closest to the routers. This way they are physically close, and they wont get tangled. Not the answer you're looking for? Browse other questions tagged hardware storage cable cable-management or ask your own question. How can I clean up a spaghetti monster of cables? How to test fiber patch cables?